As you can tell by my surname, I married a guy with a bit o’ German in him. 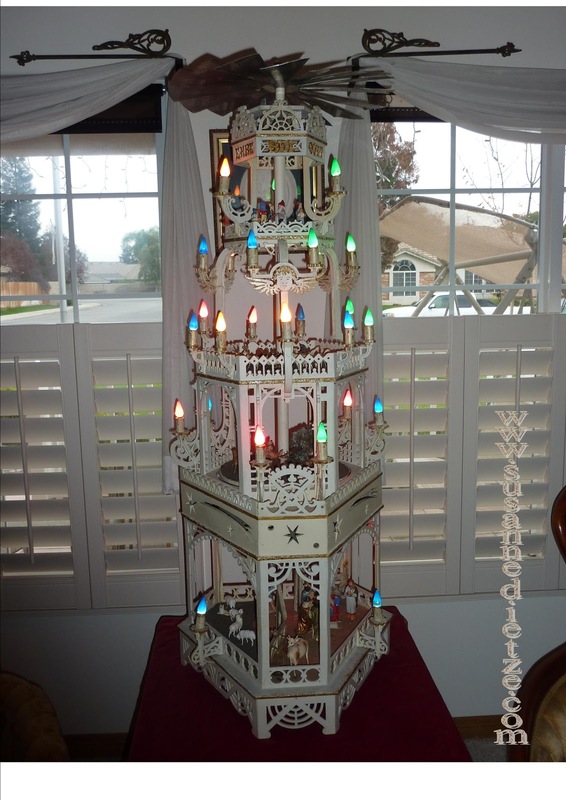 My hubby's paternal grandfather emigrated from Dresden Saxony to the U.S. through Ellis Island, and although he embraced his new country, he kept many of his homeland’s customs—including the Christmas Pyramid, or Weihnachtspyramide. 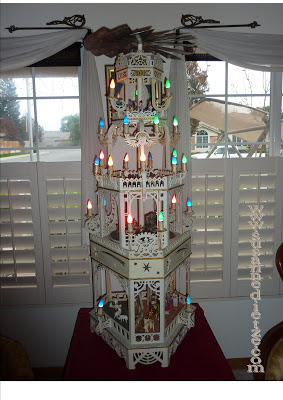 Maybe you’ve seen smaller versions: they are shaped like wedding-cakes or towers with one or more tiers, small enough to sit on a table-top or large enough to light up the town square. 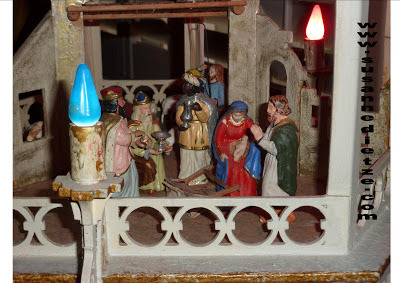 Figures resting on each platform depict a scene from Christmas or everyday life: angels, a nativity, toys or something from the workplace. The tiers rotate around a central drive shaft like horses on a carousel, driven by the rising heat of candles placed on or around the body of the pyramid, which spins a propeller at the top of the pyramid. Originating in the mountain region of Erzgebirge, Pyramids have been in use since the Middle Ages--although not necessarily as Christmas decorations. It's possible that the first Pyramids were modeled after the horse-powered gins in the local mines. Pyramids with movable mining scenes were displayed for the wedding of the Saxon prince in 1719. Sometime around 1800, they became primarily a Christmas item (possibly predating the tradition of the Christmas tree), although the name “Pyramid” didn’t come about until after the Napoleonic campaign saw soldiers return from Egypt in the late eighteenth century. It became a traditional for the head of the household to create one for his firstborn's first Christmas. That's what happened in my husband's family. The Dietze pyramid pictured above, which sits in the front window of my father-in-law’s house, was carved by my husband’s grandfather in the late 1920’s from linden wood, using a coping saw. He used figures imported from Germany to decorate the four tiers. It is no longer driven by candle heat, which made the platforms spin too fast. As you can see from the photo, it is electric now, wired in 1934 to be lit by electric bulbs (which are now vintage and tricky to find). In 1939, a new adjustment was made when my husband's grandfather installed a record turntable to rotate the platforms. Ready for a tour? Let's start at the bottom, which displays the Birth of Jesus in Bethlehem (this tier does not rotate). One half features Joseph, the Magi, and Mary with Baby Jesus on her lap. The other half of the lowest platform depicts a shepherd and his sheep, lingering just outside the stable where Jesus was born. You can see one of the Magi behind the central blue light, and in the upper left quadrant, an angel hovers over the shepherd. Up a level from the nativity scene, a traditional German hunting scene is shown. 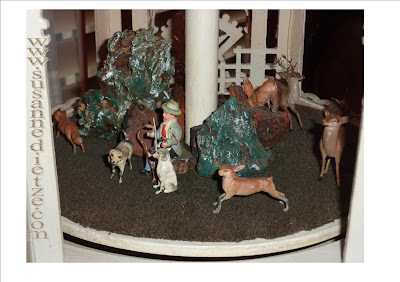 The hunter rests his rifle (and his dogs) while the forest animals go about their business. Some of the animals are quite perky--especially the fox, who has a squirrel in his mouth. 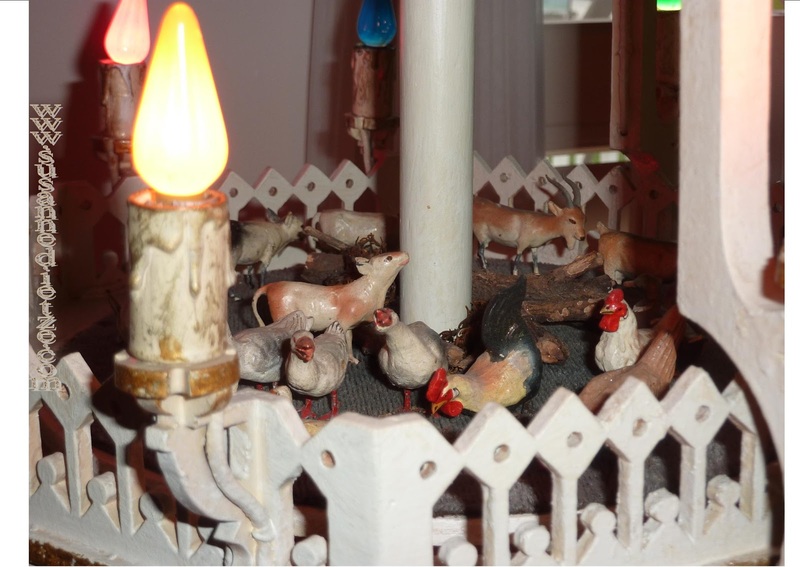 The third level from the bottom depicts farm animals: goats, cows, and “lucky” chickens—also a traditional scene. 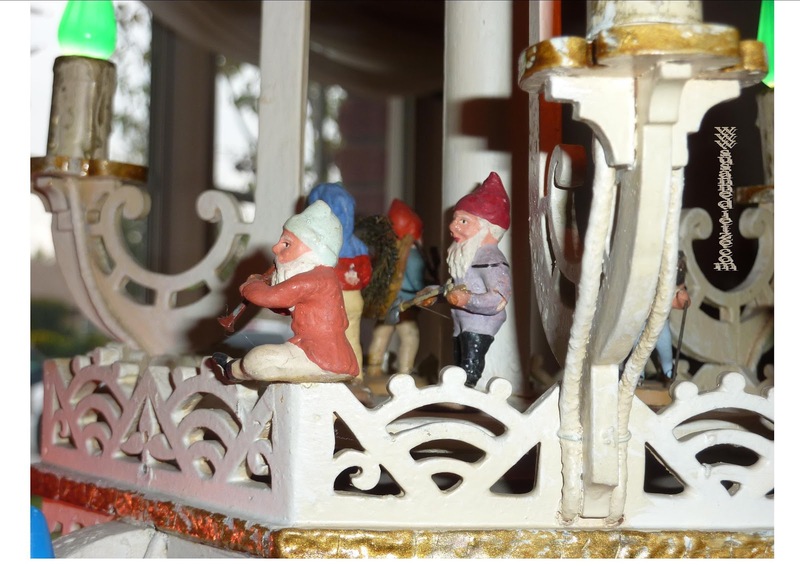 On the top platform, gnomes (not elves) are busy getting ready to help Sinter Klaus prepare for Christmas Eve. I like how the gnome in orange is propped on the edge with a clarinet-type instrument. The pyramid is crowned with the message, Ehre sei Gott in der Hohe, or honor to God in the highest. 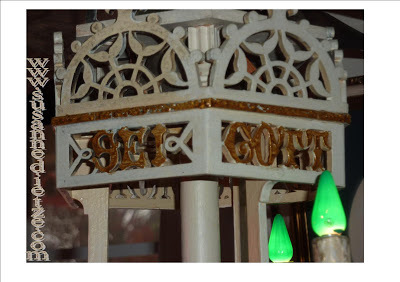 Housed within, just under the propeller, are three tiny bells. Their tones echoed through the house while my husband drifted off to sleep as a boy, and their notes still signify Christmas to him. Remember what I said about huge outdoor pyramids? Below, I’ve included a you tube video of one in Fredericksburg, Texas. This one features Nutcrackers, a nativity, and some nice Christmas music. Every family has precious heirlooms, and treasures or traditions that mean Christmas to them. With each marriage and birth, new traditions arise. Christmas morning, my favorite cranberry bread is served alongside my husband's traditional stollen, and alas, we have no Pyramid of our own. But the tradition of the Pyramid holds a special place in our hearts and memories of Christmas past. What about you? 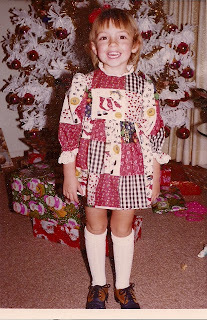 What are traditions you’ve inherited from your family? What traditions have you invented for your children? I'll share a few of our foodie traditions in the comments, but here's one of my favorite new family traditions that's come with my kids: The Toys Visiting Baby Jesus. This picture is a few years old, but "friends" still have a way of creeping into the stable to pay homage to the Newborn King. Even Jedi and Polly Pockets need Jesus. Thanks for showing us this beautiful piece of craftmanship. What a treasure for your family! SOme of our family traditions have fallen away (no more Christmas ham for a family that's mostly gone veggie- I especially miss making split pea soup). The one that has stayed is that every year my children and now my grandchildren get a new tree ornament. They each have a new one for each year of their lives. Thankfully they moved out as it was getting quite hard to put them all on the tree because I have a huge number of my own. oh- we always have cinnamon rolls and orange rolls for brunch, courtesy of the Pillsbury dough boy. We get new ornaments too! The kids are set! Ok, here's a weird Christmas Day tradition: we eat bean dip. Most likely, while still wearing pajamas. It started out a few years ago as something to fill our tummies until dinner. Now it's almost a ceremony. It evolved to the point where my parents, husband, kids and I stand around the crock pot in our pajamas eating it. The dip doesn't even make it to the table anymore. It's just soooo good. It's full of cheddar cheese, cream cheese, sour cream, & salsa. This is a precious and unique Christmas heirloom, Susie. I've never heard of one of these. It's so lovely. And I love that your husband's grandpa made it. My great grandmother, whom I never met, was from Germany. I will have to ask my dad if she had one of these when he was growing up. Thank you for sharing this with us! Suzie, my husband never met his grandpa, either. Mr. Dietze lived a long life but the generations were spread apart. I think Pyramids are pretty regional, too (Saxony is close to the Czech Republic border). Beautiful area. But maybe your g-grandmother had one! Ah yes, our Bethlehem visitors. This year hasn't seen as many. But there is a snowman decoration that has been used as a Godzilla around the other decorations--thankfully not the Nativity! Susie, what a neat tradition! I have never seen these either, but what a treasure. We've got a few traditions that have survived. The kids get new PJs on Christmas Eve every year. And we put out a nativity of carved ebony that Joel got while he was growing up in Madagascar. It is really beautiful. My great grandmother was from Württemberg. I think it's far from Saxony, near Switzerland. 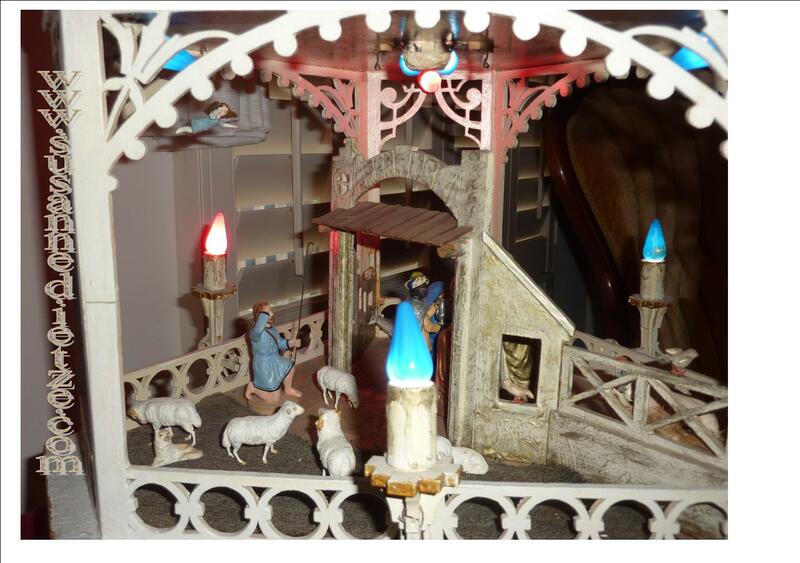 Oh Lisa, I'd love to see a pic of the ebony Nativity. It sounds lovely. I have friends who get new pjs every Christmas Eve. I may need to look into the sites they use to buy them. They sound fun! By the way, our Christmas background looks gorgeous. I love it. We (=son) just had a Nutcracker wrestling match at my house. Cracked me up. You're so cute! Thank you for showing the pic of you as well as the Christmas pyramid. I've never heard of this tradition, either, but as you showed the different variations, I realized that we have a small one called Angel Chimes. Mom had one and I loved it so much, I bought my own after I married. Sometimes it was hard to find stores that carried the little candles, and yes, it did create a powerful push when it got going. And the faster it went, the faster it chimed. :) I still have it - but haven't used it in years - since my inquisitive boys tried to figure out how it worked and kept taking it apart. Time to take it back out, I think. Karl's grandfather created beautiful fretwork. I'm so glad to see that it's survived through the years. Merry Christmas to my Inky sisters and to all our friends and readers. You all make my life special and I pray God's blessing on you and yours during this season and the coming year. Thank you for the wonderful post, Susie! I know I'm a bit partial, but I think it is beautiful!